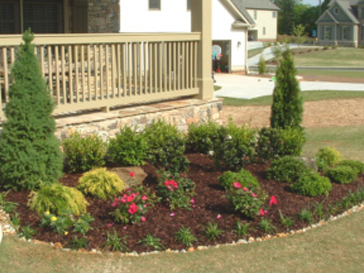 Complete Landscape Installation and Maintenance. Fertilization Your lawn receives at least four in-season feedings throughout the year. 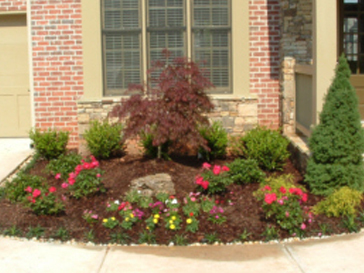 Timed-release fertilizers are formulated for the specific needs of your lawn at the time of application. Broadleaf Weed Control In mid-spring, we clear out dandelions and more than 50 other common lawn weeds. Then we watch for any new invaders throughout the year, and we eliminate them at no extra charge. Crabgrass Prevention & Annual Weed Prevention One or more applications of Pre-Emergent is made in early spring to prevent crabgrass and/or controllable annual weeds from invading the lawn throughout the season. 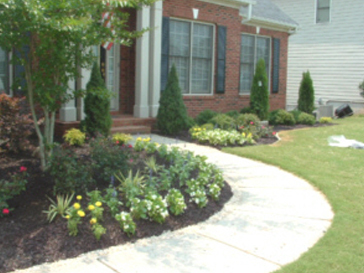 A selective lawn herbicide is applied, which won’t harm your lawn and kill over 200 broadleaf weeds in Southern lawns. Continuous Monitoring Your lawn is inspected before the first treatment is made. Thereafter, each treatment is recorded, and the lawn is continuously monitored to insure that it is progressing on schedule. If a problem develops between inspections, you can phone our customer service and a specialist will be dispatched to your lawn to take care of the problem. Core Aeration With this procedure, we remove small plugs of soil throughout your lawn to improve the flow of air, water, and fertilizer into the root zone of the lawn. This remedies “root choking” compacted soil problems. It is also effective in reducing the build-up of thatch in the lawn. (limited availability). Lawn Seeding For lawn types that can be seeded to fill in thin or bare areas, we provide a full seeding service. We use Scotts finest quality grass seed and Scotts Starter Fertilizer to get the new seedlings off to a fast, strong start. (limited availability). Free Service Calls When you sign up for our Complete Care Service, should you have any questions about the conditions of your lawn, call us and we will dispatch a company trained expert to your home at no charge to you.